Javier Mascherano has completed his £17.25m move from Liverpool to Barcelona after passing a medical with the Spanish giants on Monday. The 26-year-old Argentina captain underwent a five-hour "exhaustive" review, according to Barcelona's team doctor Ricard Pruna. 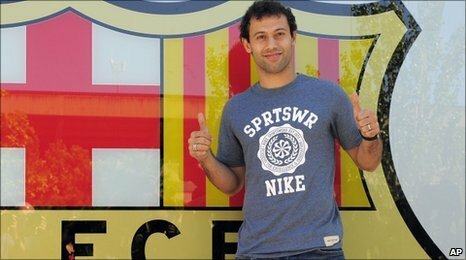 "The truth is it's a dream, it's a great joy," Mascherano told Barca TV. "It is a great club with great players and I will try to adapt as quickly as I possibly can," added the star. Liverpool boss Roy Hodgson has criticised the player's attitude labelling the switch as "selfish". "Players have got something they want to do and they just expect the club to bow down and accept it," he said. "Unfortunately there are going to be periods of time when there will be some unpleasantness because players must also understand that when you sign contracts you sign contracts to play." The transfer had been drawn out by Liverpool's insistence on recouping the £18m they paid for former River Plate midfielder Mascherano when he arrived from West Ham. The Anfield outfit had rejected an initial bid of £16m from Barcelona but he subsequently missed the Premier League defeat to Manchester City and the trip to Trabzonspor, where Liverpool secured a place in the group stages of the Europa League with a 3-1 aggregate win. Mascherano joined Liverpool from West Ham in 2007, initially on a loan deal that was turned into a four-year contract in 2008. Barcelona failed in an attempt to lure him to Spain last summer but on his return from the World Cup in July, Mascherano made it clear he wanted to leave Anfield, saying his wife could not settle in England. Since taking charge of Liverpool in July, Hodgson had been eager to end the uncertainty surrounding Mascherano's future. Liverpool also received a bid from Inter Milan, now coached by Hodgson's predecessor Rafael Benitez. But former Fulham boss Hodgson dismissed the offer from the Italian side saying: "We received a fax about Mascherano [from Inter], but it was a joke fax."